Elena Ford: Global products call for a unified global marketing approach. DETROIT — Ford Motor is preparing to reap some marketing savings from its global vehicle platform efforts. When the 2010 Ford Focus is launched nearly simultaneously around the world, each individual-market campaign will share the same creative talent, says Elena Ford, the company's new director of global sales, marketing and service operations. "I'll have one global creative director for each product launch rather than a creative director in each country, starting with the Focus," said Ford, 42, the great-great-granddaughter of company founder Henry Ford. She was promoted to the new position last week as part of a reorganization intended to make Ford's advertising and marketing efforts worldwide speak with a single voice. But Elena Ford also sees significant savings in streamlining the production of advertising and marketing materials. For example, instead of using dozens of teams of photographers to shoot the Focus in each market, Ford can use digital technology to employ perhaps only five teams. And by centralizing digital design and printing, Ford can order brochures and other point-of-purchase materials from one or two printers instead of a printer in each market, said Jim Farley, Ford group vice president of marketing and communications. The savings will come in handy. The company's marketing budget will decline "in parallel with overall revenue," Farley said. He declined to say by how much. And with 2009 sales in major markets forecast to decline further this year, marketing efficiency is critical. Farley called the increased global marketing effort "the next step in our One Ford vision." In 2006, Ford reorganized its global product development in an effort to build products that can serve markets around the globe. Within five years, Ford pledges to have four vehicle platforms — for small- and mid-sized cars and commercial vehicles — that are identical in North America, Europe and Asia. Ford will continue to handle marketing with its regular advertising agencies, all part of WPP, Farley said. Other parts of Elena Ford's duties include enhancing brand image worldwide, boosting the Ford brand at auto shows and other public events and expanding Ford-branded licensed merchandise globally. Elena Ford has held four other director-level marketing positions in the automaker's North American or international operations since her first assignment as a Ford brand truck advertising specialist. 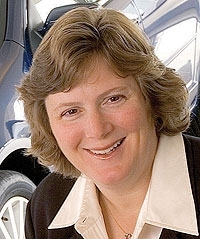 Before joining Ford in 1995, she was a senior account executive for Wells, Rich Greene Advertising in New York.